We designed our home with the thought of ways to save money through energy efficient ways. 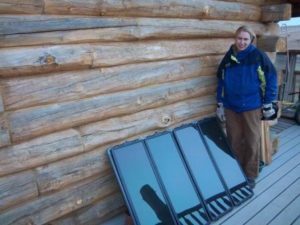 Before we even explored areas of solar energy, in the realm of solar panels and batteries, we thought of how to best position our home to capture the most sun energy. Designing our home so sun that would come through our south windows in the winter time, and take advantage of our walk out porch, which shades the house during the summer when the sun is at its highest level. We also built our house into the side of a south facing slope (hill). This provides for coolness in the summer and insulated warmth in the winter. Prior to purchasing the land, we evaluated how much wooded area is surrounding our home-site to evaluate the efficiency of using dead wood as a heat source, without having to buy or haul wood from long distances. Our air-air heat pump, an above ground system, utilizes the heat out of the cold winter air, before it kicks in to full auxiliary heat, when we choose not to use our wood stove. The wood stove is centrally located in the basement of our house with an open stair case next to it. Ceiling fans help in moving the warm or cool air to places in the house where it is most needed. 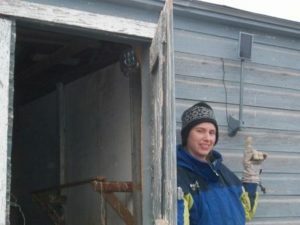 We were conscious as to how we insulated our home for energy efficiency also. Our home is a log house. What makes these logs unique is that they are harvested near Rosebud, South Dakota. Most people likely do not realize that the Rosebud and Pine Ridge have Pine Forests. These Prairie logs are unlike Mountain logs, in that their growth is much slower. Thus the R value in the logs is much denser; which is great for insulation. In the winter, the interior side of the logs absorbs the stove heat. They provide a very uniform, radiant heat; unlike any stick built house. We come from a long line of Nebraska and Dakota ranching lineage. We aren’t so much “Green” as we are conservationists and think in a way of efficiency. Now with a little background on our home and our way of thinking, the readers may have a better understanding of what we are achieving with solar supplementation. We live in an area where our electrical rates are very inexpensive. Yet, we understand levels of responsibility and are interested in alternative methods of energy. Because our rates are inexpensive, it makes solar as an alternative rather expensive. So we have implemented systems on very small, practical scales. 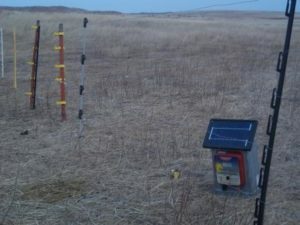 First, we utilize solar energizers (www.parmakusa.com) for our electric livestock cross-fencing. This is a very portable system which can be moved to enhance proper grazing management, for which we apply to our land. The most basic solar energy resource we have is sun to grass, grass to ruminant, ruminant to a milk or meat food source. The same concept can be considered as a homeowner. Second, we utilize an electric bicycle (www.currietech.com), when convenient. My commute to work is an eleven mile gravel road, one way. I have used the electric bicycle to travel that distance. It takes almost one hour to travel those eleven miles. As the price of fuel increases, this might be a viable alternative. The batteries may be recharged with a solar battery generator. 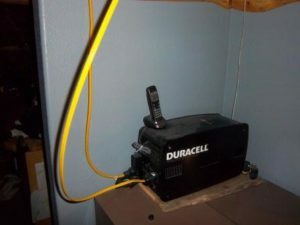 Third, our solar generator (www.mysolarbackup.com), is an expensive, but wonderful alternative because of it’s flexibility. It can be charged and taken with for a weekend camping adventure. It is great for supplying an alternative energy source for basic lighting in home. It is great to run a sump pump or any electric tool or appliance in an area of the ranch for which we don’t have electricity. The dimensions are only: 8.5 inches wide X 18.5 inches long X10.5 inches tall and 65 pounds. It is charged by 90 watt solar panel, providing 1800 watts of peak power. We have tested running a 21 cubic foot refrigerator for two hours or a twin tube twelve volt fluorescent shop light for ten hours. So in the case of a winter power outage, or simply to step off the grid; it is a handy piece of equipment. Fourthly, we are about to install a solar system that we find advertised often with a well known (www.menards.com) distribution center. This will be a four panel solar system, with an output of 60 watts. This system we can then have several twelve volt batteries, charged for longer power outages or additional supplemental lighting. We can all play our part in being more energy efficient. When you start using solar alternative, you develop more respect for the energy sources, whether hydroelectric or coal or wind, for which we take for granted.